Lorenzo is a computer technician and an electrical technician as well. In 2009, after the death of a loved person, he had an operation on herniated disc because of his painful spine which didn’t let him move. Some time afterwards, he begins listening to “voices” in his house. He doesn’t know where to go to ask for help. Some people appear, help him, let him know what is happening and change his life and his perception of it completely. 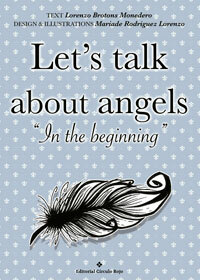 “Let’s talk about angels. In the beginning” is his first book where he collects some writings and own experiences. As he is a sensitive person, he guides people to the spiritual self-help so as to know and re-educate the negative aspect of the being and this way, he can help people to discover the wonderful angel of the light who in fact all of us are.